The spacious grounds of Forrester Park Resort were the perfect setting to accommodate the team from Quaker Oats for their team building Scotland event filled with fun filled and skilled activities which made up the Team Challenge Company Crystal Challenge! With twenty teams all vying for the fantastic Team Challenge Company Trophy and desperately trying to avoid the wooden spoon the competition was on from the start as the team captains were selected. Across the day each of of our teams had the chance to go around several activities and win some crystals, and those who managed to get the most crystals would end up in the Crystal Dome to grab the cash! A huge number of different skills were required around the many different rotations including the mental aptitude on the NASA challenge. Although all our teams managed to get some amazing scores the top score of the day was 0, not even a single wrong answer! Our highest score of the day was an astonishing 48 points. Not the finest moment there that's for sure! The make up for the brainstorming session, the individual challenge was the Flag Race, where one more crystal was up for grabs for the fastest and most agile person! Over on the physical challenge that was Chicken, Fox and Grain the teams were delighted that the sun had stayed away for a change as they donned the fluffy costumes to carry out the task. Thankfully all our teams eventually worked out a strategy and completed the task! There was another chance at gaining a crystal with the individual challenge Giant Buzz Me which required a steady hand and a calm mind, although not everyone managed the task and only four teams walked away with a crystal! There was a chance for the Robin Hoods to show themselves over on the Archery where whichever team who scored the highest number of points would gain the crystal! There was also the Nail It where the best accuracy was the way to winning the crystal. Yet another mental challenge was the Interlocker, where the time limit put some serious pressure on our teams which resulted in several breakdowns... Only joking! A few if our guys really showed off some great moral and easily took away several crystals! After a fantastic BBQ lunch and some recovery time the teams went on to their final two activities before the Crystal Dome finale. On the Laser Clay Pigeon Shooting, the teams came down and had a few practice shots before the real competition began. Those who happened to have a sharp shooter or two picked up the points with ease, especially during the Rapid Fire round. Of course this wasn't the only chance to win a few final crystals, there was also the Catapult where the longest distances were rewarded with yet more crystals! After a juice break, it was finally time to count up the days rewards, to see who had manager to rack up the crystals and who would be taking on the dome! Our top five teams stepped in with our top number of crystals being 17! Amazing effort. Each of the top five took their chance and managed to get at least some money in the pouch but nobody more than Team 19 who walked away with a fantastic score of £400! Not only did they take the glory but this of course meant that they were our winners of the Team Challenge Company Trophy! The next big reveal was also who was going home with the dreaded wooden spoon, and it was a clear winner by a mile unfortunately! Team 7 tried their best throughout the whole day but managed to only get two crystals! At least they enjoyed themselves! After a lot of running around everyone was ready to head home! Thankfully the day went without any rainstorms and we hope everyone thoroughly enjoyed their day! We had a ball and all the feedback today has been extremely positive from everyone – even the people who didn’t want to come originally! Bob and the team have such enthusiasm it’s catching – I think that they are a real asset to your company. What an absolute pleasure it was to work with Hayley and her team in designing and delivering this fantastic day of Team Building at Forrester's Park. Lots of entertainment and competitive spirit throughout the day from all teams - and I really can't believe Team 7 came last Hayley!!! Personal highlight was over the on the Laser Clay Pigeon Shooting, where there were some incredible shots and some not so good...especially those people holding the gun like a bazooka! Delighted all went so well on the day, and already looking forward to next year's re-match! What a fantastic day guys! Everyone here has been talking about it today and how it was the best event that they've been to! 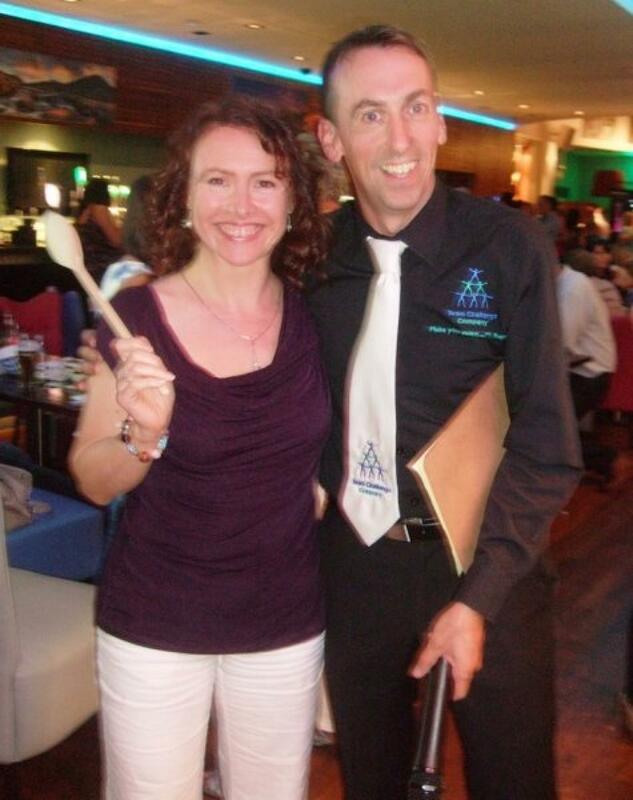 Even my wee losing team had a great time and lots of laughs...I've actually become quite attached to the wooden spoon! Thank you so much to everyone at Team Challenge - you guys are what makes the day. Well guys! Thanks for a fantastic day at Forresters Park. The amount of energy you all put in was what made the day such a success and it would be a pleasure to work with you all again!